US Special Counsel Robert Mueller has concluded his investigation into Russia’s role in the 2016 presidential election and whether President Donald Trump unlawfully sought to obstruct the probe. Trump has repeatedly denied collusion and obstruction, calling the investigation a “witch-hunt”. Russia has denied interfering in the election. Paul Manafort, the former campaign chairman of Trump’s campaign has been convicted in Washington and Virginia of crimes related to years of Ukrainian political consulting work, including allegations he concealed his foreign government work from the United States and failed to pay taxes on it. 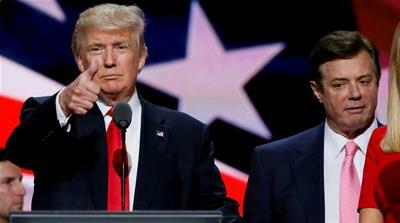 Though the charges don’t directly touch Trump, Manafort has nonetheless remained a figure of considerable intrigue and enjoys the continued sympathy of the president, who has left open the door for a pardon. Trump’s former national security adviser, Michael Flynn, pleaded guilty to lying to the FBI just days after Trump took office by telling agents that he had never discussed sanctions with the-then Russian ambassador to the United States. The White House said Flynn had misled administration officials, including Vice President Mike Pence, about the conversation and ousted him weeks later. 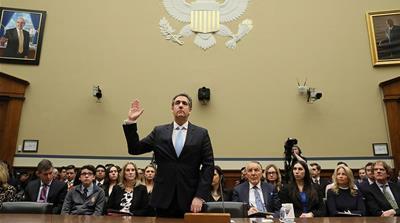 He has since become a vital cooperator for Mueller, having met 19 times with investigators. Prosecutors aren’t recommending any prison time when he’s sentenced next week. Trump’s longtime lawyer and fixer, Michael Cohen, is at the centre of not only Mueller’s investigation but also a separate, and rapidly mushrooming, investigation into hush-money payments. In Mueller’s investigation, Cohen has admitted lying to Congress about a proposed real estate development in Moscow. He told politicians the negotiations were done in January 2016 when in fact they stretched deep into the campaign. He also pleaded guilty in New York to campaign finance violations stemming from the payments, with prosecutors saying last week that he “acted in coordination and at the direction of Individual 1” – or Trump. George Papadopoulos, the former Trump campaign foreign policy adviser served a 14-day prison sentence after admitting lying to the FBI about a 2016 conversation with a Maltese professor who told him that Russia had “dirt” on Hillary Clinton in the form of stolen emails. Information about Papadopoulos’s contacts during the campaign started the FBI’s Russia investigation. Twelve Russian military intelligence officers were charged in July with hacking into email accounts of Clinton’s presidential campaign and the Democratic Party and then facilitating the release of tens of thousands of private communications. It remains perhaps the most direct example of what intelligence officials say was a broad conspiracy by the Kremlin to meddle in the 2016 election on Trump’s behalf. 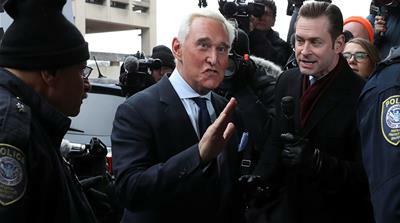 A longtime Trump confidant, and self-proclaimed “dirty trickster” of Republican politics, Roger Stone is charged with witness tampering and lying to Congress about his efforts to gain advance knowledge of WikiLeaks’ plans to release damaging information on Clinton during 2016. Though a Stone tweet from 2016 – “Trust me, it will soon the Podesta’s time in the barrel” – appeared to presage the disclosure of hacked emails, Stone has said he had no inside knowledge about the content, source or timing of WikiLeaks’ disclosure. WikiLeaks founder, Julian Assange, who has been under Justice Department scrutiny for years for the group’s role in publishing government secrets, has been an important figure in the Mueller probe as investigators examine how WikiLeaks obtained emails stolen from Clinton’s campaign and Democratic groups. The president’s eldest son has attracted scrutiny for his role in arranging a Trump Tower meeting in June 2016 – also attended by Manafort and Trump son-in-law Jared Kushner – at which he expected to receive damaging information on Clinton. He has said the meeting was a waste of time because he didn’t receive anything interesting from the lawyer, Natalia Veselnitskaya.